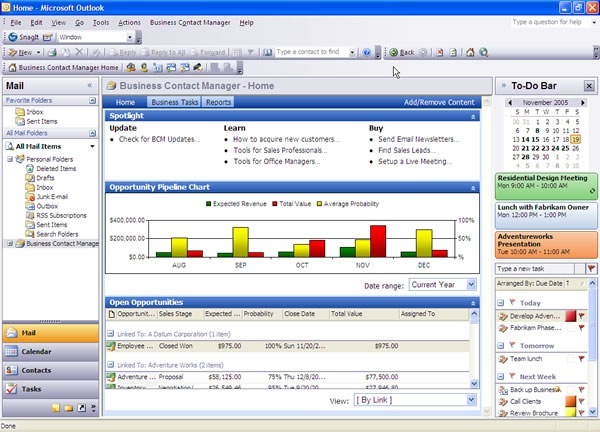 We’re currently experimenting with a number of different CRM systems, including Sage’s ACT!, SalesForce.com, 37 Signals’s Highrise and Microsoft Business Contact Manager for Outlook 2007. It looks like Sage, feels like Sage, and runs like a dog like Sage. The search feature is terrible and although it does “plug in” with Outlook it doesn’t do it very well. On the plus side, you only have to pay a one-off fee for the software license (this is a desktop piece of software). After my trip to FOWA London 2008, I had Force.com “Software as a Service” ringing through my head. SalesForce.com is an online tool which does integrate with Outlook. However, the main downside for us is the cost, which would have worked out at £3,000 per annum with our current number of users. Coupled with the not-so blown away feeling we had after using it, we’ve filed this one under B.
We’ve used Basecamp in the past, and thought that Highrise could be the solution to our CRM needs. You can export your Outlook contacts to CSV and import them into Highrise, but after using it for two weeks it was just another thing we had to open up every day, login and keep running. It doesn’t have direct integration with MS Outlook or our Exchange setup, and for this reason we decided to chop it. Business Contact Manager for Outlook 2007 provides an extra set of menus and options to manage your Business Contacts, Accounts and Projects. It provides a central repository of contact information with custom fields all nicely in Outlook, which every member of staff keeps running in the background during the day. Plus we have a whole bunch of licenses under the Microsoft Action Pack scheme. After setting up a trial on one of our machines we decided we were happy enough to try it across two users’ machines. BCM gives you an option to “Share your database”, so we set that up and all seemed well. Only when I logged on later that evening to check my mail did I discover a major flaw – the other PC was off and BCM could not load the database. Of course, the data is stored locally on the master user’s PC. After digging a little deeper I discovered that BCM installs a new instance of SQL Server Express Edition 2005 on your machine called MSSMALLBIZ. I downloaded and installed SQL Server Management Studio Express and successfully connected to the instance, and found the database. I ran a manual backup of the database, copied over to a spare Windows 2003 VM instance I had running and loaded it up on SQL Server 2005. This all seemed a bit easy until I tried to connect my Outlook BCM to the new server – not found. Hunting around on the web a bit more I discovered that the local SQL Server instance was running on a non-standard SQL port, 5326. My VM instance was running on 1433. After changing the default port to match what BCM was expecting, it connected up and away we went. Having to do all of that dirty work feels a bit like I was bending BCM to work in a multi-user environment, so I’ll be very interested to see how it fares over the coming weeks.